So I got home at about 8pm today, ate dinner and started flipping through channels on the TV. I came across a special for Hosoki Kazuko's birthday, who is a well-known fortune teller. She has people on a show and then gives them (typically brutal) advice, from what I could tell. I really couldn't believe some of the advice that she was giving. This particular special had 100 female high school graduates on the program. They would survey the audience about a topic, get the results, and then Hosoki Kazuko would give a little lecture. Anyway, she seems to be extremely conservative. That isn't necessarily a bad thing, but I certainly think that from an American perspective, people would think she is setting women's rights back about 40 years. For example, one of the questions was "Do you regret losing your virginity?" These girls are all about 17 or 18 I think, and the poll answer was something like 22 yes to 78 no. Hosoki ripped into them for being too young and being deceived by men because they are too trusting. Certainly that might be a problem, but I would think that for most people there they were dating people their own age, and how else does one learn about the world anyway? That really isn't too shocking, but she also had some other really bad advice I thought. One girl said that she was really looking forward to starting to work and taking a job. One of the reasons she gave is that it is a way to get independence, and if for some reason she had to get a divorce, how else would she support her family without a career? That doesn't sound like a bad thing to be thinking about to me, but Hosoki completely lambasted her for that. She gave some expression amounting to basically: "Women should have a child, love, protect, (maybe one or verb ending in ru). Men should go out, work, fight, struggle, (etc.). Together these two build a family. That is the role for humans. (Women and men.)" Another woman said she wanted to become the Prime Minister in the future. She was told that it is a very honorable and good thing to become a mother and house-wife. There were some other things like that, but I was just really struck by her opinions. Now, I don't have anything against women who want to be housewives. But I also think it is great for women to want to have a career, and men should try to house husbands as well sometimes. I was ready to go to bed, but while flipping around I ran into 都立商売 (School of Water Business), a Japanese drama based on a manga that I know nothing about. Water business though, is generally red-light district night-life stuff. This drama is a comedy about a girl who transfers into a high school where people learn to be hostesses, bartenders at gay bars, escorts, stuff like that. I believe it is just a single 1:45 minute drama thing, and it is unbearably bad, but like a train wreck I can't stop watching it. The main actress, playing the role of Yamashita Sanae, is amazingly interesting: a half Japanese (I'm assuming half, I only know that her dad is British) woman named "Becky" (short for Rebecca) that has been living in Japan. Her Japanese is just perfect, unlike some of the foreign actors you see on tv (and she doesn't grate on my like David Spectre does.) Some interesting information on her on the Japanese wikipedia. Looks like she went to Asia University's Business Administration school in Japan, and has been in some shows in the past few years going only by the nick-name "Becky". I'm really impressed by her, and even though I really should go to bed now, I've somehow gotten drawn into this otherwise very average drama that is horribly over-acted. Here are some pictures from the official site. I don't know how long they will last, but give them a try. On Wednesday morning I went to Hiroshima City University (広島市立大学) and met with Professor Hidetsugu Nanba (難波 英嗣), and was introduced to Dr. Teruaki Aizawa (相沢 輝昭 先生). I gave my multi-lingual multi-document summarization talk, as well as a brief demo of NewsBlaster and a short talk about graduate student life at Columbia University. Professor Nanba and one of his students, Ms. Taniguchi, gave a talk about their work on PRESRI, an automated survey paper generation system, although currently it identifies survey papers. Afterwards I met with some of the students, and saw a brief presentation on some of their hetergeneous database searching research that also uses some interesting citation analysis methods. I had some Hiroshima Yaki (a type of okonomiyaki) at Micchan (a chain) at Hiroshima station. Then I caught my 6:30pm Nozomi to Tokyo, and arrived at Shin-Yokohama at 10:10pm. I wish they had electrical outlets so I could use my laptop for longer than the hour that the battery lasts, but I really like the Shinkansen rail system. It is very comfortable and convenient. Tuesday I visisted Dr. Masui (桝井先生) at Mie Daigaku. He introduced me to Dr. Atsuo Kawai (河合 敦夫 先生) and I was able to see some demonstrations of the research that they are doing. They have some very interesting work on identifying errors in Japanese and English (particles and determiners respectively) and some interesting Q&A work, as well as automatically learning features for nouns from the internet. Some of the Q&A work uses patterns, similar to Sasha's genus / type identification for ACQUAINT. On Monday morning I caught the Kanki 3 train to Tsu (津) and met with Professor Nanba of Mie Daigaku. He and two of his students (Naito, who was very talkative, and another student who was not as talkative) took me to Ise Jinguu (伊勢神宮). Ise Jinguu is a very large temple, one of the main ones in Japan, that has a "moving shrine" that is destroyed and re-built in a new location every 30 years I believe. There are two main grounds, the outer temple (外宮) and the inner temple (内宮). We visited and walked around both. Before we went to Naiku, we stopped at Okage yokocho, an area of lots of little shops and restaurants. We had a nice gyuudon for lunch, and then went on to the Naiku temple. It was really impressive: the grounds are just huge. And, they have lots of nice places to store rice. On Sunday, I visisted Nittaiji temple in Nagoya with the Maedas, and we also saw a small local Matsuri aimed at kids. It was very interesting. Nittaiji had some interesting Buddhist artifacts that were donated by the King of Thailand, according to what I could understand. So maybe that isn't really the case. The five-level pagoda was built about five years ago, so it was interesting for me to hear that new construction of traditional temples still continues. That probably shouldn't have surprised me though. I caught a 3pm Shinkansen from Tokyo and arrived in Nagoya at 4:22pm. I met with Maeda-san, and we went back to his house where we met with his daughter Ryoko, her two children Amane (2.5) and Hitoki (.6), and later on Masao and his wife Chisato and their two children, Yuusuke (3) and Motoki (1.x?). A total of four grandchildren, and they were all very active, especially Amane-chan. We had a great dinner of tempura and sukiyaki, and I really ate my fill. Later, at about 10pm, we were able to use iChat to video chat with Mom and Dad back in Texas, which was a lot of fun. All the little grandkids enjoyed seeing themselves on the computer, and Amane liked screaming at the camera. She just likes screaming in general though, it seemed. On Friday I left the Keihana area and headed to Kyoto to meet with Professor Toru Ishida, whom I was introduced to by Professor Sal Stolfo. 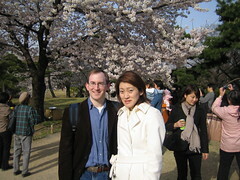 Professor Ishida spent some time at Columbia University years ago. We had a nice lunch and talked about the upcoming "Language Grid" project and other things. I should contact Isahara-san at NiCT. After meeting at Kyoto Daigaku for lunch, I headed out to Kinkakuji. It was really nice - the golden pavilion is just so dominating. I took some pictures with my Japanese cell phone, but it turns out that the camera on that thing is like 64x64 or something! It's horrible! While walking to the temple I met a family of three from Utah who had visited Kiyomizutera and Ginkakuji earlier in the day, and were finishing up with Kinkakuji. It seems like they were having a really nice vacation in Japan, which is nice to see. After Kinkakuji, I headed back to Kyoto station and had a coffee. I tried to connect to the free wireless network in Kyoto, but you had to register (in person!) to get an account to set up a VPN. So that didn't go anywhere. Anyway, I caught my Shinkansen at 7pm, and made it back home by 10:00pm. So my sister tells me that I need to see the group "American Analog Set". They are currently touring Japan, and as luck would have it they played in Kyoto while I was there interviewing. According to my sister, the girl making her dress, Jesse, is dating the drummer of AmAnSet. Since I'm staying about 40 minutes away from Kyoto, it is a bit of a hike for me, but I thought it would be stupid not to see them, so I headed out. The first group up was 13 & God and I liked them. They had some nice soft soothing music, punctuated by really hard rocking parts and loud, fast rap. A guy I was talking to in the audience told me that the album is almost completely mellow, which was really surprising given the show, but I'm definitely interested in picking up their album, or perhaps some of the stuff from the component bands, since "13 & God" is apparently the joint work of a group called "the Notwist" and "Themselves". Here is a kind of nice review of their history together. "Doseone" even had one of those thinkgeek favorite LED belts. And at least one song was about gravity and atmosphere, so it has a geek appeal that I would like to check out. After 13 & God, American Analog Set came on. Unfortunately, I had to leave after their first song in order to make it back to the station to catch the last train (I actually got the second-to-last train) back to my hotel. But I did pick up their latest album, "Set Free" which has 4 bonus tracks (remixes) for the Japanese release. I didn't hear a thing out of the closing band, Her Space Holiday. I gave a talk today at ATR (also in Kyoto) and met with some people there: Dr. Yutaka Sasaki, the head of the Natural Language Processing department. I also spoke briefly with Dr. Eiichiro Sumita, a principal researcher in the NLP group, and I heard about Dr. Kiyonori Ohtake's work on Japanese paraphrasing / simplification. After lunch with Dr. Sasaki, I met with Yoshinobu Tonomura, the deputy director at NTT. We talked for about half an hour I believe, and I think he was impressed with (if nothing else) my Japanese. Of course, that train had no reserved seats remining so I had to chance the unreserved seating, but since it was only the second stop, there was plenty of room. I arrived at Kyoto at about 11:45am, and arrived at NTT at about 12:30pm. The talk went well, and I met with Hideki Isozaki, supervisor group leader of the Knowledge processing group, Eisaku Maeda, Tatsuto Takeuchi (HR, Research Planning Supervisor), Naonori Ueda (Executive Manager), and Hajime Tsukada (Senior Research Scientist.) I really got the feeling that I would be welcome there. It was a nice visit, I saw a demo of their Q&A system, and heard about some knowledge ontology work that they are doing. A few days ago, I saw a show on "Maid Cafes" - places where the staff dress up in Maid costumes, but otherwise normal cafes. There are apparently a lot of them in Akihabara. Admittedly, that is a very popular destination for their presumed target audience: Otaku, but there still seems to be a very large number of these things. There are at least 5 or 6 in Akihabara, and that was just after a quick internet search. I didn't think it was worth counting after seeing there were that many. I resolved to go check one of these places out when I got a chance. I went to Akihabara today to pick up a cooling pad for my laptop since it has been getting very hot lately. I decided to get lunch at the first Maid Cafe I came across. I found a place called Cure Maid and went in. I had a nice Tonkatsu Curry Set for 1000 yen. What really surprised me was the normalcy of the place. There were at least twice as many women in there as men, which was the big surprise with me. It seems like these are just normal mainstream cafes, where the wait staff happen to dress up. I think maybe some of acceptance might be due to the wide publicity the "Otaku" has been getting recently in the Japanese media, especially from shows like Densha no Otoko, but it is still pretty surprising. While I was there, I saw at least two couples come in for dates. In both cases the girls in each couple were semi-cosplaying. One of the girls was wearing a very cute dress, most likely handmade, that was in an Alice In Wonderland theme. It had a cute hearts and spades pattern, and some cat imagery (possible Chesire-inspired, but it didn't look like the Chesire Cat to me.) Anyway, that was a bit more in-line with my expectations. After making my purchase, I wandered around for a while and saw this sign for the Linux Cafe. Now that is some place that I would like to visit. Apparently, they offer free wireless with purchase, which is very rare in Japan. 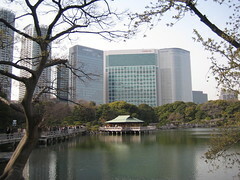 It is a place that I will try to visit on my next trip to Akihabara. I can't say that I go there all that often though, so who knows when that will be. I met up with Fumie today, and we stopped by the Apple store in Ginza. It is a nice store, with five floors and very curious elevators. Clear glass, but no buttons. They are mind reading elevators. They had a whole bunch of iPod Nanos, and they are a lot cooler than I first thought. They are just amazingly small. Afterwards, we found a nice restaurant that is お忍びダイニング, which just means that you are at semi-private tables. It has nothing to do with Ninja food. It was a really nice dinner though. Yesterday, Eric, Sharon, and I went to a Matsuri at Toritsu Daigaku. They had a Taiko drum that Eric and Sharon enjoyed beating on for a while.